Ever eager to try my hand at new authors I quickly snatched up the opportunity to check out the debut novel from author Rebecca Rasmussen and am pleased to report that the story inside is just as lovely as the cover outside. 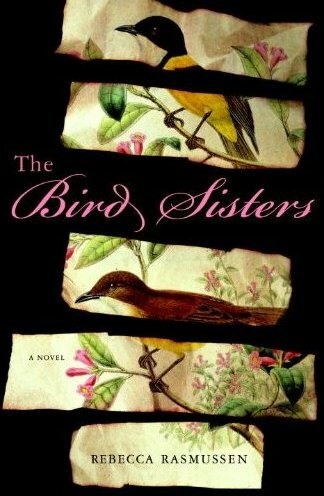 The Bird Sisters tells the story of two spinster sisters, Milly and Twiss, known as the Bird Sisters in their small town. Their twilight days pass quietly, mostly spent in reflection that old age summons, with the odd person bringing them an injured creature. Twiss tends to the birds while Milly tends to the humans – hearing their problems and feeding their souls. Told in chapters that alternate between the present and past, Milly reminisces back to the summer of 1947 - the summer when their fearless and bewitching cousin Bett visits and their world gets turned upside down. Readers can’t help but be charmed by the sisters, who share a special bond despite their differences in personality and aspirations. Milly is the pretty, amenable sister who daydreams of love, a husband and children. And Twiss, the stubborn tomboy who prefers playing golf with her father and rebelling against her mother. The summer of 1947 is a time of great change for them both as they deal with events that will shape their futures. Sweet and thoughtful, The Bird Sisters is an exquisitely written novel that will pull at the heart strings and keep you up late into the night reading. Rasmussen’s talent shines in her debut and I am eager to see what her next project will be! For more information please visit Rebecca Rasmussen's WEBSITE. FTC: A copy of this book was sent to me by the publisher in return for an honest review. Very nice review. I enjoyed this book as well. I'm so excited to read this one -- it's waiting on my nightstand! I really want to read this one, but there is no sign of it in the bookshops here yet. Hopefully soon. I won this one in a giveaway and just got it in the mail yesterday. It's such a beautiful book. It sounds so good too. Your review makes me want to read it even more. Love that quote too! I have seen so many great reviews for this book that I had to buy a copy of it. I hope to get to it soon. I may have to bump it up the pile after reading your terrific review. I have read wonderful reviews of The Bird Sisters and am glad you enjoyed it, too. I am intrigued by Milly and Twiss and look forward to reading their story. I like their divergent personality and expect its part of what makes them so captivating. I love that Twiss' focus is the birds while Milly has a way with humans. I cannot wait to find out what happens the summer Bett visits. Thank you for an engaging review. I am looking forward to reading this book!